Dainty and detailed, this beautiful rainforest butterfly charm is presented in sterling silver and encrusted with a selection of multi-coloured swarovski crystals. A fashionable and feminine addition to your Chamilia charm collection. 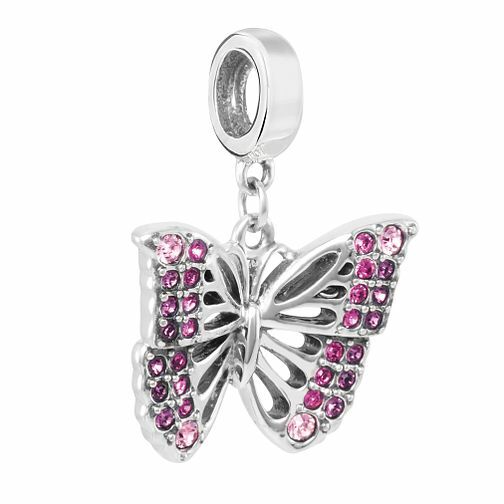 Chamilia Rainforest Butterfly Charm with Swarovski Crystal is rated 5.0 out of 5 by 1. Rated 5 out of 5 by Anonymous from Rainforest butterfly Bought this as a gift for my sisters bracelet. I was really impressed how beautiful this was. H Samuels service was as promised on the website and delivery was nice and prompt. Well done Samuels.